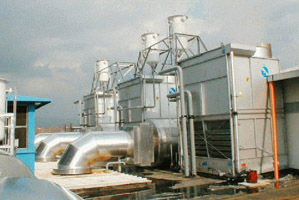 Manuli Film, Naples, Italy, with three (3) Rolls Royce KVGS-18G2, lean burn, natural gas engines, each 3030 kW electrical. Thermal power is utilized both from exhaust gas and cooling water for plastic film production. Required to meet emission standard of 400 mg/Nm3 @ 5% O2 for carbon monoxide and 150 mg/Nm3 @ 5% O2 non-methane hydrocarbons. 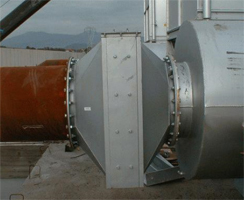 DCL supplied three (3) reactor housings containing catalyst elements with dimensions 556 x 581 x 92 mm, capable of being individually loaded by hand.The units were installed in 1998 and operated for over five years before the replacement of catalyst elements was necessary. Copyright © 2008-2015 DCL International Inc. All Rights Reserved.